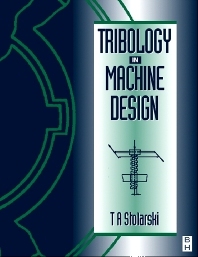 "Tribology in Machine Design is strongly recommended for machine designers, and engineers and scientists interested in tribology. It should be in the engineering library of companies producing mechanical equipment." The computer offers today's designer the possibility of greater stringency of design analysis. Dr Stolarski explains the procedures and techniques that allow this to be exploited to the full. This is a particularly practical and comprehensive reference source book for the practising design engineer and researcher. It will also find an essential place in libraries catering for engineering students on degree courses in universities and polytechnics. The material is grouped according to applications for ease of use and reference. Student and practising mechanical engineers, tribologists and design engineers. Introduction to the concept of tribodesign; Basic principles of tribology; Elements of contact mechanics; Friction, lubrication and wear in lower kinematic pairs; Sliding element bearings; Friction, lubrication and wear in higher kinematic pairs; Rolling contact bearings; Involute gears. Tadeusz Stolarski is a Professor Emeritus of Mechanical Engineering at Brunel University, UK. In addition to his research and lecturing on topics including fracture mechanics, tribology, and design principles, he has also performed consultancy work for a variety of companies including Castrol International, SKF, and Advanced Bearing Technology.